The modern miter saw is a powerful piece of machinery, and to operate safely and efficiently, it requires a solid foundation. A high-quality miter saw stand can have a major impact on your cutting performance, and it will help to prevent serious accidents. When shopping for the best miter saw stand, you need to know what to look for. Portability is a very important feature to consider because you don’t want to constantly be confined to your work table. Depending on how you plan to use your saw, it’s possible that you’ll need to transport it to different locations. For maximum portability, you should consider a stand that breaks down and assembles easily. It’s also important to understand the different types of stands and how they’re used. You’ll find that most miter saws are compatible with a traditional stand, which is made with two wooden saw horses. A wooden plank sits across the saw horses, and although this stand is very strong and can be used with many different tools, it can be difficult to break down and transport. Rail stands are quite popular, and they’re usually made with four pull-out legs. The rail will have a horizontal design, and once the saw is removed, this stand is easy to transport. The third type of stand is designed to sit on a tabletop, and it can accommodate a wide range of miter saws. The downside is that a tabletop stand must be bolted to a table, and you’ll have trouble trying to move it around. The fourth option is called a compound stand and consists of several different parts. With two horse supports, it uses a strong plank to support the saw, and since it’s lightweight and compact, it’s easy to break down and transport to various worksites. Many consumers make the mistake of choosing a miter saw stand that isn’t designed for the work they plan to do. If you want to get the most out of the stand, it should be a good fit for the jobs you’re planning to use it for. When shopping for the best miter saw stand, you should always check to see if the height can be adjusted. 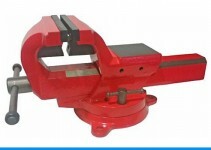 A clamp is also an important feature because it will lock objects in place and make the cutting process safer. Below, you’ll find reviews for 10 of the best stands for miter saws, and by selecting a product from the list, you can save your time and money. The DEWALT DWX724 features a compact design and accommodates miter saws from all brands. With a lightweight design, this stand is easy to transport and doesn’t take up too much space. It’s made from durable aluminum and weighs 29.8 pounds. 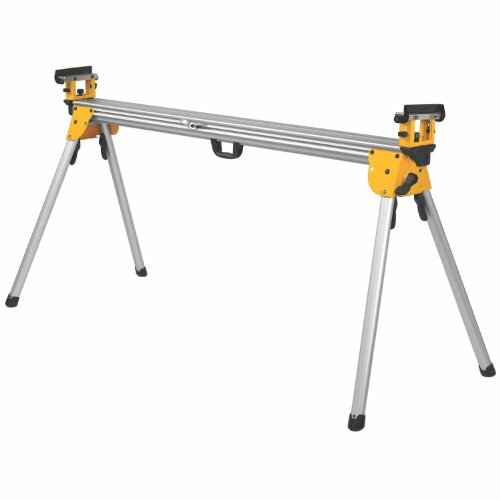 If you’re looking for a stand that is easy to transport between worksites, then this saw is worth considering. It has a 40-inch beam, which can be extended to support 10 feet of material. The durable aluminum construction is ca hold 500 pounds, and although the legs are very strong and supportive, they’re also easy to fold and store away. 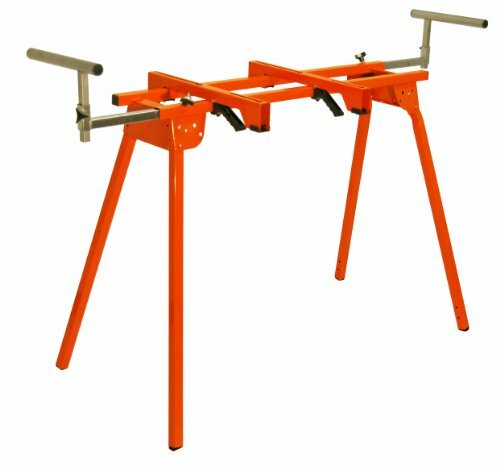 This saw stand features a universal design, and for improved safety, the legs are built with lock levers. The DEWALT DWX724 has mounting brackets for tools, and it allows you to securely mount your miter saw to the supports. The supports are easy to reposition, and they can be set up anywhere along the rail. A set of non-marring feet prevent material from getting scratched, but you’ll need to purchase a miter saw separately. 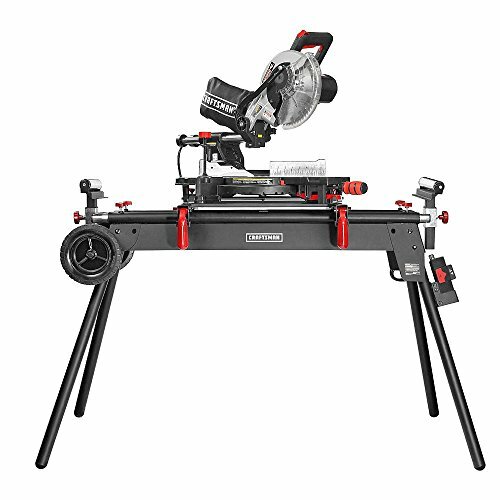 The PROTOCOL Equipment WS-077 serves as a durable workstation for your miter saw, and with components made from high-grade steel, it’s strong enough to handle tough applications. This stand is designed for maximum compatibility, and it will work with saws from most brands. The material support pegs deliver a solid foundation for cutting, and for additional functionality, it has mounting brackets for your tools. The legs can be folded with the quick-release levers, which makes transporting the stand extremely easy. Once the legs have been folded up, you can roll the PROTOCOL Equipment WS-077 on the two sturdy wheels that it’s made with. This stand has a 77-inch adjustable top width, and the 30-inch mounting height is ideal for a variety of applications. Since this is the contractor model, it’s a top pick for contractors, but it’s just as useful when used at home. It has universal mount brackets for tools, and the heavy-duty steel construction can handle tough jobsites. Here we have another popular product from DEWALT, and with a universal design, the DEWALT DWX723 can be used with most types of miter saws. 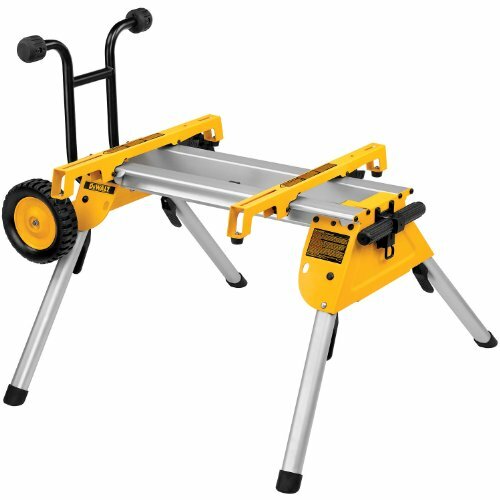 Like the DEWALT DWX724, this model features a lightweight aluminum design, and it weighs in at only 35 pounds. It’s easy to carry between worksites, and it can support up to 16 feet of material. Despite the lightweight design and aluminum construction, this saw stand is capable of holding up to 500 pounds of material, which is important for heavy-duty applications. The DEWALT DWX723 has non-marring feet on the tool mount, so you can avoid accidently scratching material. 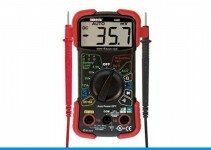 This product is strong, portable and compatible, and the main beam is backed up with extensions. The extension lock levers help to extend the length of the stand by 50 inches, and the support mechanisms offer additional impact resistance. Although it’s a heavy-duty product, this stand is easy to store because it comes with folding legs, and the mounting brackets will work with any saw. DEWALT has some great products, but we can’t forget about the Craftsman Deluxe Miter Saw Stand. This product can support up to 330 pounds, and it’s designed to work with most 10 and 12-inch saws. It uses a two-outlet power strip and has a length of 80 inches. With universal mounting brackets, it helps you get the perfect fit and eliminates wood waste. When the wood you’re trying to cut begins to slip, the situation becomes dangerous, which is why this stand grips the wood tightly. A set of strong steel legs can be locked into place, and they can support 330 pounds of material, which is more than enough for most applications. 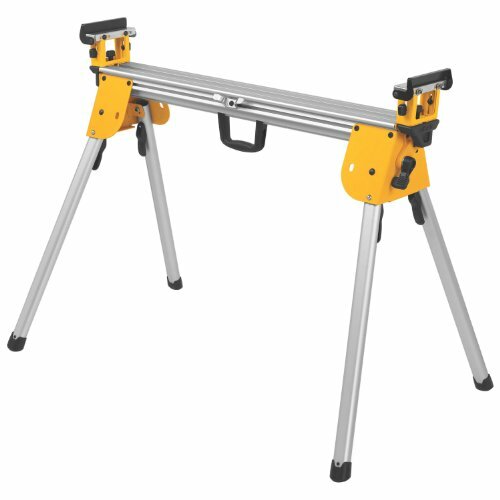 This saw stand comes with two steel rollers, and they’re good at keeping longer pieces moving through the 80-inch length of the stand. If you choose to purchase and use this stand, you’ll never have to worry about bumps ruining your wood. The universal mounting brackets allow you to quickly place 10 and 12-inch miter saws, and the two-outlet power strip makes it possible to work away from standard electrical outlets. When shopping for the best miter saw stands, you’ll notice that most of the products are DEWALT because the company makes great stands. The DEWALT DW7440RS is a good example, and despite its lightweight design, it can support hundreds of pounds of material. The lightweight construction weighs 33 pounds, and it’s much easier to carry than many competing stands. This product features a heavy-duty kickstand, so it can be balanced for greater mobility and easy storage. The DEWALT DW7440RS comes with convenient stand brackets, which makes attaching a miter saw quick and easy. The wide stand base provides additional stability, and offset rear legs help to support heavy loads. The legs are foldable and use quick-release levers. The HICO UWC4000 is a top stand for miter, scroll and band saws, and it uses universal quick mounts to secure these essential tools. With a weight of only 24 pounds, this stand is compact, lightweight and versatile, and the legs can be folded for easier storage. 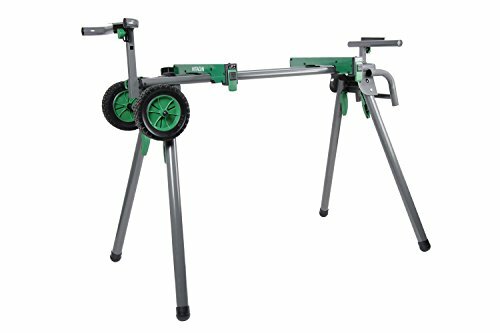 The HICO UWC4000 comes with 20-inch mounts for tools, and it can support up to 500 pounds of weight with its tubular steel construction. It features a maximum extension size of 81 inches, and the bed length is 30 inches. The company that makes this stand is known for high-quality products, and the HICO UWC4000 is specifically designed to make woodworking easier, safer and convenient. 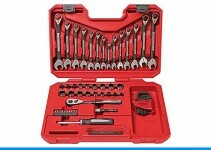 This stand is easy to assemble, and it can be used with a wide range of different tools. The Hitachi UU240F is another popular option, and with a frame made of heavy-duty steel, it has no trouble supporting 400 pounds of material. It’s also designed to support longer material with specialized support extensions. For maximum versatility, the Hitachi UU240F can be used with 12-inch sliding miter saws, and the height can be adjusted without special tools. This stand is easy to assemble and uses quick-release mounting brackets for easier mounting. If you’re looking for a product that makes it easy to attach or remove your miter saw, this stand is worth considering. To protect delicate surfaces and prevent accidental scratching, this stand comes with non-marring feet, and for repetitive cutting jobs, it features built-in, adjustable material stops. Auxiliary mounting brackets give this stand universal compatibility and eliminate the need for additional mounting surfaces. To support longer materials, the Hitachi UU240F has work supports that can be extended by 95.5 inches. This stand is also easy to transport over tough jobsites because it has large treaded wheels. 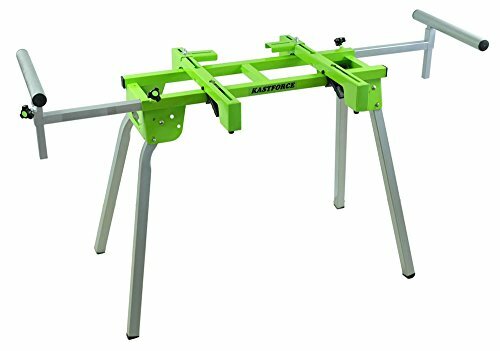 The KASTFORCE KF3001 is made to fit all eight to 12-inch sliding compound miter saws, and the extension length can be adjusted up to 81 inches. For greater convenience, it has folding legs, which makes assembly easier. Although this stand is ideal for miter saws, it also supports a variety of other benchtop machines, and it’s particularly useful for bench grinders, thickness planers and scroll saws. With dual work supports, this stand can support up to 500 pounds, and the overall design offers better maneuverability than many competing products. If you’re looking for a reliable stand for your miter saw, this product is worth considering, and it even works great for other types of tools. 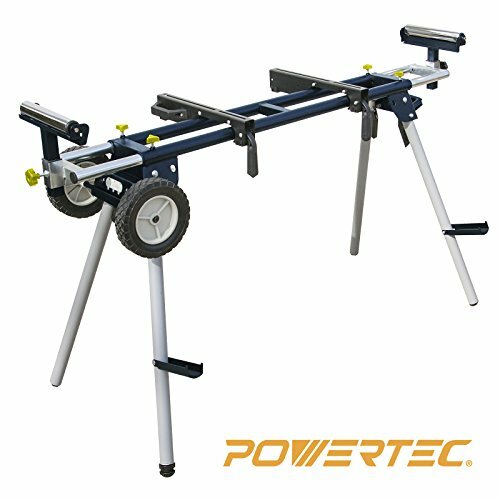 The POWERTEC MT4000 is made from round steel tubing, and with a strong design, it supports materials up to 330 pounds. Since it features a compact design, it’s easy to transport between jobsites, and it’s just as useful at home. For maximum mobility, it has eight-inch rubber wheels, and the POWERTEC MT4000 can support 10 and 12-inch miter saws. The support arms can be extended up to 79 inches, and they can be retracted by 46 inches. The spring-loaded locking legs take seconds to set up and require the same amount of time to break down. 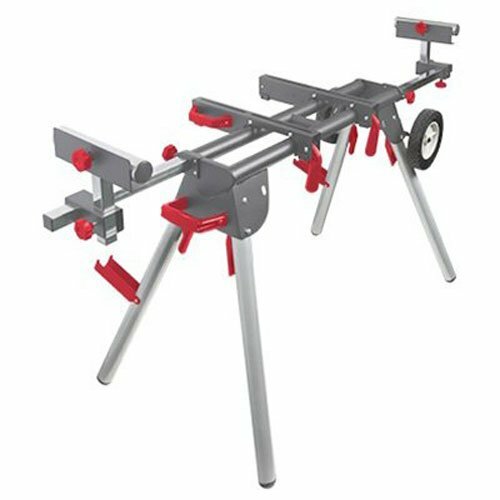 With universal mounting brackets, this stand can support miter saws from most brands, and for smoother feeding, it comes with steel rollers. The HTC PM-4000 offers a 36-inch work height, which makes projects easier, and it makes woodworking safer with a heavy-duty design. For better aesthetics, it has a powder-coated steel finish, and the folding legs are easily assembled with a snap pin. When this stand is not in use, it can be stored away in a tight space, and a lightweight design makes it easy to transport between jobsites. To deliver great stability, this stand uses 20-inch quick mounts, and it can support up to 500 pounds of weight. The long design allows this stand to support 10 feet of material, and the supports can be extended by 116 inches. If you’re looking for a reliable miter saw stand for contractor work, the HTC PM-4000 is worth considering.